The arrival of February means Spring Training is looming — A’s pitchers and catchers report to camp in less than two weeks. 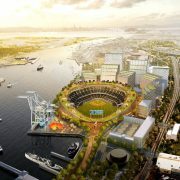 As per usual, the Athletics have been calculated and concise in their offseason approach of improving from a season ago. Oakland greeted winter in need of starter depth, and filled that need with a high-value, low-cost veteran expected to fill a spot at the top of the rotation. They were faced with several massive considerations, and were willing to bid farewell to an ’18 All-Star knowing that replacements were available. But it has not been a perfect offseason. Here are the pros and cons of the A’s offseason moves thus far. The A’s announced the free agent signing of Estrada on Jan. 25, and GM David Forst said immediately that the expectation was for the 11-year veteran to slide directly into the top of the rotation, adding that the two sides had been in contact for more than a month. As manager Bob Melvin said while discussing the signing, starting pitching is expensive. In Estrada, the A’s added a workhorse and former All-Star at a team-friendly $4 million for one year — by comparison, Charlie Morton, who boasts a comparable resume to that of Estrada, signed a two-year $30 million pact with the Rays. 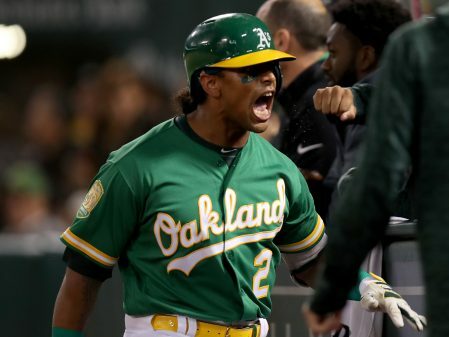 The veteran leadership along with his history of eating innings (179 per 162 team games) is exactly what Melvin and the A’s needed. Cost-efficiency is a huge bonus. He will join Mike Fiers whom the A’s retained with a two-year $14 million deal. 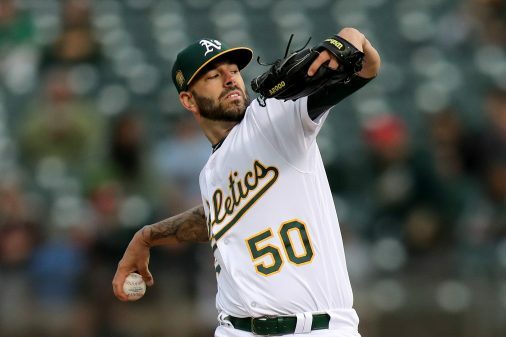 Fiers began his Oakland career fantastically last July but fizzled a bit down the stretch to finish 5-3 with a 3.74 ERA in 10 starts with the green and gold. Oakland Athletics starting pitcher Mike Fiers (50) throws a pitch in the first inning as the Texas Rangers face the Oakland Athletics at Oakland Coliseum in Oakland, Calif., on Monday, August 20, 2018. The reason Oakland was able to get a guy who was named an All-Star just three years ago had much to do with his down 2018. In 28 starts, Estrada went 7-14 with a 5.64 ERA. The right-hander will be 36 by mid-season though, which does not help his case. Estrada does not need to win 20 games, nor does he need to revert back to the low- to mid-3.00 ERA of his best years. Being a reliable innings-eater at the top of a young pitching staff checks all the boxes. Oakland Athletics designated hitter Khris Davis (2) reacts after a two run home run in the first inning as the Minnesota Twins face the Oakland Athletics at Oakland Coliseum in Oakland, Calif., on Friday, September 21, 2018. In his final season of arbitration eligibility, the A’s were able to strike a one-year deal worth $16.5 million with the 2018 major league home run king and avoid an arb hearing. 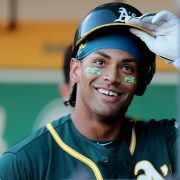 Clearly, reaching an agreement means the slugging DH will be in green and gold again in 2019. More importantly, avoiding arbitration means that the two sides are close enough on the discussions of dollars to reach a one-year deal. This means that the A’s will not have to stand up in front of a board of arbitrators and break down every reason that Davis is not worth the contract he is in search of. This is the sort of thing that creates animosity. The only con to this deal is that it covers 2019 alone. Both sides expressed interest in a long-term deal. “KD” loves Oakland and Oakland loves him, the probability that the two reach an agreement beyond this his 31-year-old season is high. 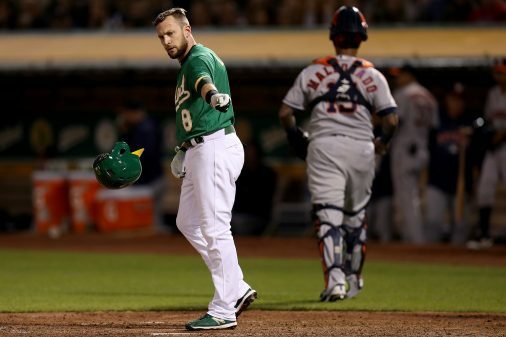 Oakland Athletics third baseman Jed Lowrie (8) reacts after striking out in the fifth inning as the Houston Astros face the Oakland Athletics at Oakland Coliseum in Oakland, Calif., on Friday, August 17, 2018. 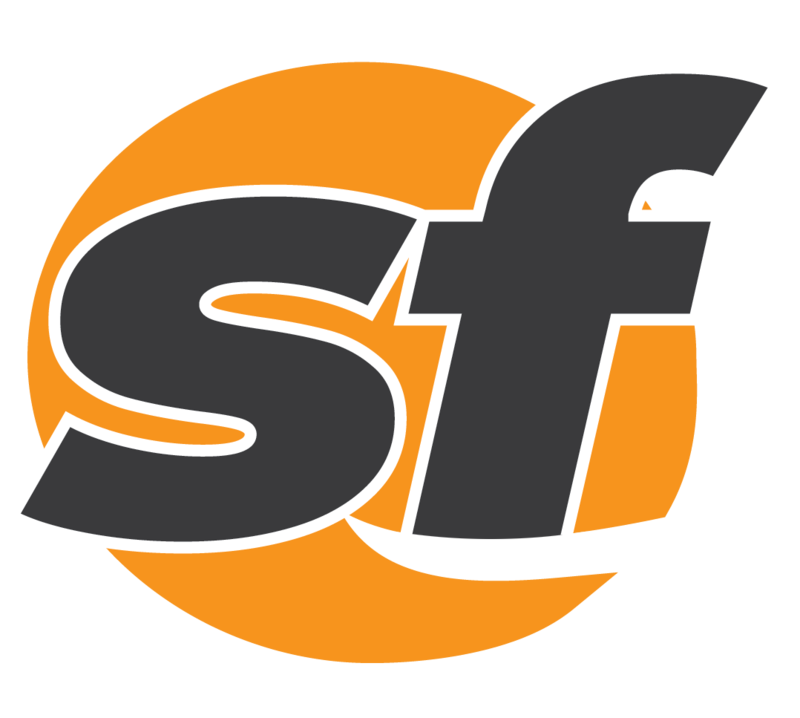 Oakland bid adieu to a pair of All-Star veterans, replacing them via trade for second baseman Jurickson Profar and free agent signing of catcher Chris Herrmann. The clear advantage to stepping back — at least on the surface — at both positions is, it clears the way for a pair of top prospects to seize the everyday roles at both positions. Franklin Barreto has long been among the A’s top prospects, and is fresh off a third-place finish in the MVP race in the Venezuelan winter league. Adjustments were made in his approach, looking to increase contact, and Forst was pleased with his play in Venezuela. That being said, Profar, fresh off his best big league season (coincidentally in the first season that saw him get more than 324 at-bats), is more than capable of carrying the load at second. He homered 20 times last year, finishing with 61 extra-base hits — he had collected just 36 in four previous seasons. And he is a significant athleticism upgrade from Lowrie coming off a 10-steal season without being caught. 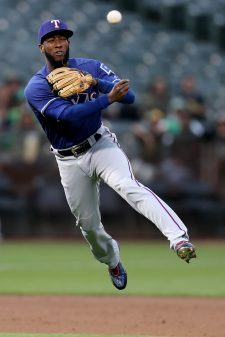 Texas Rangers third baseman Jurickson Profar (19) throws out Oakland Athletics third baseman Matt Chapman (26) in the first inning as the Texas Rangers face the Oakland Athletics at Oakland Coliseum in Oakland, Calif., on Tuesday, August 21, 2018. Sean Murphy is the club’s top non-pitching prospect (No. 47 league-wide) heading into the season and is expected to bust into the big leagues this year. A common thread among Oakland’s top prospects, Murphy has served precious little time at the Triple-A level (just 12 games, all last season). But he has hit consistently at every level and is most recognized for what he does in the tools of ignorance, not in a batting helmet. Lowrie made his first All-Star Game appearance last year, at 34 but just one year removed from surgery to repair a deviated septum. Normally, a player’s talent should be tailing off by now, but his ability to sleep better has him at the healthiest he has been in his career. He could definitely repeat his performance of 2018 in both ’19 and ’20 which would make him very well worth the two-year $20 million deal he signed to join the Mets. Also, he has been called the most professional hitter on the club by Melvin and numerous players over the past couple years and provided leadership by example for a mostly young core of position players. He will be a tough loss. Lucroy’s offensive numbers weren’t there last season, but each of the young pitchers he worked with — and Oakland has many — improved. Chris Bassitt credited pitching coach Scott Emerson for the improvement both statistically and culturally within the A’s pitching staff, but both Melvin and staff ace Sean Manaea sung Lucroy’s praises all year. Not only is the two-time All-Star gone from the Oakland roster, he joined the Angels, who have their own pitching staff problems to sort out. With several young hurlers approaching big league debuts this season, the veteran leadership of a guy like Lucroy will be missed. 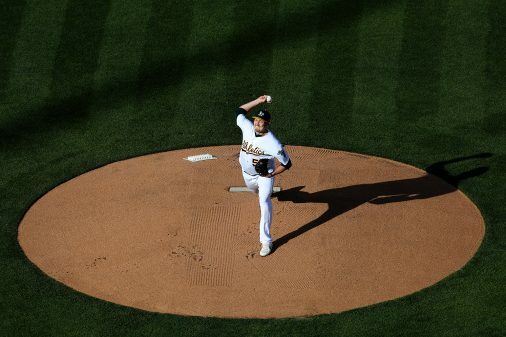 Oakland Athletics starting pitcher Trevor Cahill (53) throws a pitch in the first inning as the San Francisco Giants face the Oakland Athletics at Oakland Coliseum in Oakland, Calif., on Saturday, July 21, 2018. After experiencing both highs and lows, each of the veterans were granted free agency this offseason. Similar to Lowrie and Lucroy, allowing the trio to walk gives top prospects room to challenge. Guys like Jesus Luzardo and A.J. Puk, Oakland’s two top prospects, are each expected in the big leagues this season. When the A’s gone hot last June and surged into the postseason race, it was jumpstarted by dominant pitching from the trio. When they got cold, and eventually bounced from the postseason with a Wild Card loss, it was due heavily to a lack starting pitching. That being said, when the A’s arrived in New York for the Wild Card Game, all three were available. It’s pretty simple, if a team would rather rely on the bullpen to go nine innings in a postseason game than give the ball to a starter at least for the first few innings, it’s time for a new crop of starters. Detroit Tigers pitcher Joakim Soria (38) pitches in the ninth inning of the game against the Oakland Athletics at O.co Coliseum in Oakland, Calif., on May 27, 2015. 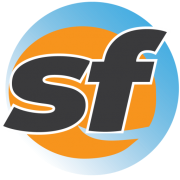 Oakland lost Jeurys Familia, Cory Gearrin, Emilio Pagán and Shawn Kelley, each of whom contributed to one of the best bullpens in baseball last season. In search of replacements, the A’s tapped the two-time All-Star, inking him to a two-year deal worth $15 million. Soria, like Fernando Rodney and Blake Treinen, has experience slamming the door in the ninth. He has also been among the game’s elite relievers at times in his career, having at one point finished 10th in the Cy Young race as a closer with the Royals. That dominant 43-save season came in 2010, when Matt Chapman was in high school. Soria will be 35 this season and has logged more than 630 big league innings in his career. That being said, he was effective yet again last year, splitting time between the White Sox and Brewers and finishing the season with a 3.12 ERA and 1.137 WHIP. Overall, Soria matches the moves Oakland made in the rotation: he is a veteran who knows full well how to get big league hitters out. Offensively, the changes made this winter may have been for a standstill but are focused more on creating opportunity for the next set of young stars. Altogether, the A’s did a good job of not stepping back talent-wise from last season, and if Murphy and Luzardo grow into what is expected of them this year, the A’s may have gotten significantly better.